Glueck Customer Experience monitors retail customer demographics and their experience in real-time. Glueck’s powerful analytics engine displays and reports the data against key performance indicator. Glueck Customer Experience rides on ultra-efficient accelerator for monitoring customer experience in real-time. Our core algorithm is designed to run multiple media channels with demographic models simultaneously by using Nvidia’s Tesla P4. 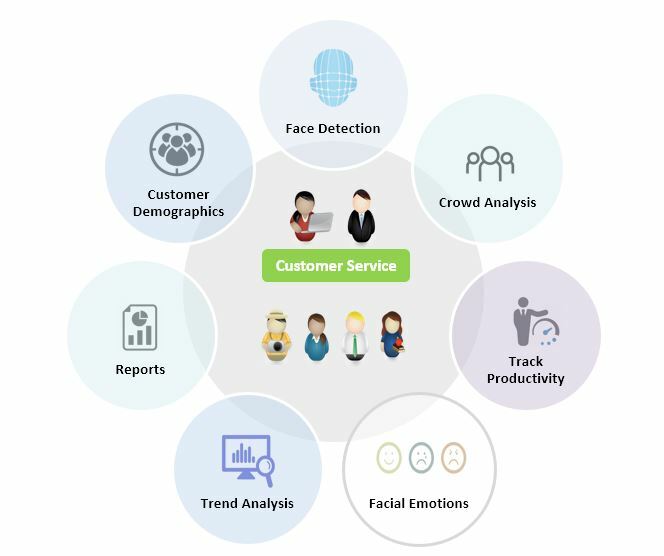 The application covers analytics for Customer Demographics, Face Detection, Crowd Analysis, Track Productivity, Face Emotions and Trend Analysis. The Reports module summarises queue efficiency & staff performance, wait times, demographics and emotional response over days, weeks and months. The same data set is mined to generate peak demographics by day, hours, weeks and months. Wireless updates through the cloud with easy to use web interface to access dashboards and reports. Audience Privacy is maintained. No personally identifiable information is ever collected, no video or still images are ever recorded, no photo archive or database is used.